A Query is an instruction or set of instructions to the database to retrieve certain data. A Query by Example is one of the simplest types of queries but also one of the most useful. 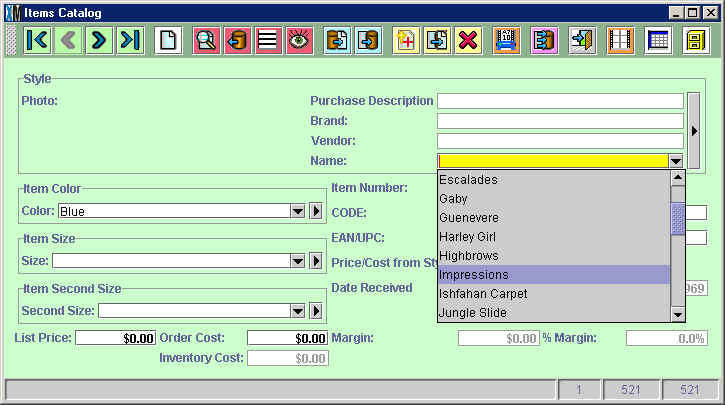 You will use Queries by Example throughout XpertMart™ to find a specific item in the Items Catalog when you do an Item Lookup a the Point of Sale; to find a specific customer by last name in the Client Catalog; or to pull up all Invoices from a specific date (using the XpertDate™ tool) in the Documents>Invoices Catalog. When you do a Query By Example, you are giving the system search criteria and you are asking XpertMart™ to find every record in the catalog (which is in fact a table in the database) that also has that search criteria. A Query by Example might ask the system to retrieve all Items that have the color "Blue". You are giving XpertMart™ an example ("Blue" in the Color field) and then asking (or querying) the system for all records that have exactly the same criteria as the example does ("Blue" in the Color field). 2) Find the field(s) where you are going to enter your example. In this case, the Color Field. 3) Enter the "example" or search criteria, in this case the color Blue. 4) Press the Query by Example Button in the toolbar at the top. Once you've followed those four steps, XpertMart™ will "pull" all records from the database table that match the search criteria you defined. In this case, XpertMart™ displays all Items in the Items Catalog that have the Color Blue. You can see how many records match the search criteria by looking at the Records Bar at the bottom of the catalog. The Selected Records Box in the middle indicates that there are 23 Items in the Items Catalog that have the Color Blue. This is out of a total number of 521 records in the catalog. Use the green navigation buttons in the toolbar at the top of the catalog to scroll through the 23 records. You can enter more than one search criteria into a Query by Example. In the example below the user is doing a Query By Example for Items that are the Color Blue and belong to the Style "Impressions." Note that when you open the Style drop-down menu the photo and description of every Style flashes by in the catalog as you scroll down.